For Rent Flags are Ready to Ship! 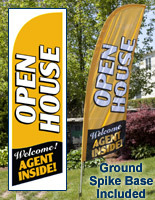 Pre-Printed Message Banners Designed for Real Estate Agents Sell in Dozens of Styles! 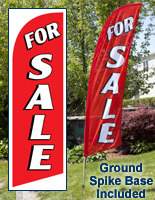 Buy For Rent Flags to Fill Vacant Homes and Apartments Fast! 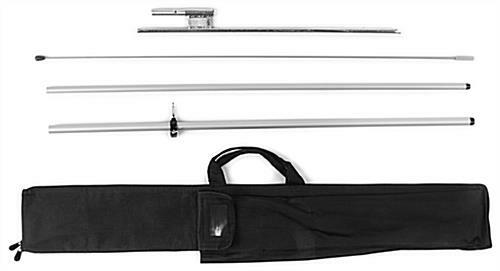 4-Piece fiberglass and aluminum pole is inexpensive, yet bows in the wind. Black nylon carrying bag for easy transport to and from listings. 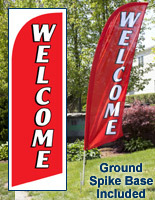 Knitted polyester FOR RENT flags are lightweight to flutter in light winds. Ground spike base for posting in the front lawn of properties. 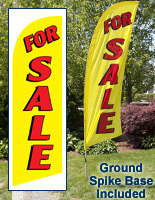 These blade banners are FOR RENT flags that advertise homes and apartments! Every potential renter driving by properties flying this banner will know a unit is available! 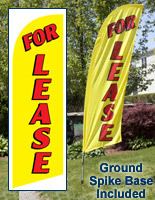 These FOR RENT flags have a bright color pattern designed to capture the attention of all whom drive by a property! Large, white-color font on red fabric creates a high contrast banner, which is easy to read from long distances. 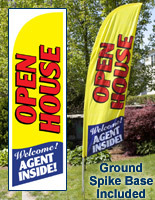 The 8' ft FOR RENT flags are the ideal height for use by those working in the real estate industry. Only one person is required for assembly. Yet, the FOR RENT flags that flutter in the wind are large enough to be highly visible in environments with a high density of promotional outdoor displays. While each feather banner is designed for maximum effectiveness in attracting attention to a property, a number of user-friendly product features were also engineered into the design. What are the product attributes making these FOR RENT Flags a great value? The answer is portability, durability and affordability! 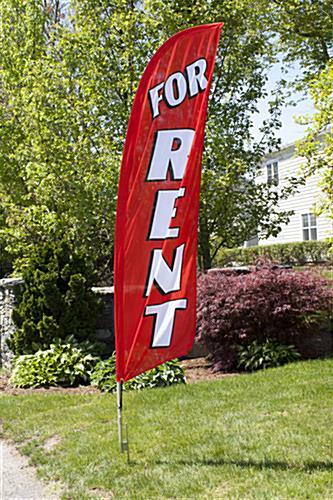 The FOR RENT flags that flutter in the wind are knitted from polyester fabric specifically for use outdoors. A cord sown onto the banner latches to the pole, ensuring the pennant does not fly off when the wind gusts. 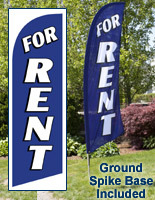 The FOR RENT flags that have a poly knit construction are more affordable than units made from many nylon fabrics. Another factor in this blade banner's affordability is the use of an aluminum and fiberglass pole instead of a 100% fiberglass pole. 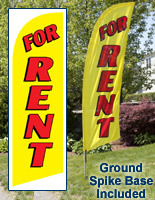 These FOR RENT flags that flutter in the wind bow and bend similar to pennants on a completely fiberglass pole do. However, the use of aluminum for the bottom two sections of the pole significantly reduces the overall cost of this unit. Similar to the aluminum pole, the steel ground spike is included due to the affordability and durability of this style of base. Real estate agents or property managers can set up the ground spike base time and time again without any risk of breaking the unit. Furthermore, the only requirement for setting this feather flag up is a surface the ground spike base can be hammered into. The combination of portability, aluminum pole, ground spike base and eye-catching design makes these swooper flags the best value on the market!